Lots of people don't like the Price-Anderson act. It is a Congressional act, which indemnifies nuclear facilities against liabilities from large scale accidents. The industry would pay up to $10 billion of any liability arising from a major accident, but after that, the government would hanle the rest. The act was created during the days of Generation I way back in the beginning because there was a lot of talk potential for disasters and no emperical evidence on how safe the industry would really be. So the act was there to offer incentives for private industry to get involved. Just last year, it was renewed until 2025. If the nuclear industry is so safe, why does it need the Price-Anderson act? If the nuclear industry needs the Price-Anderson act, why should taxpayers be asked to foot the bill for protecting them? Fifty years on from when the act was first passed, it has become apparent that it does not really need it. The liability costs since 1957, about half from TMI, have totaled around 1.5% of the cap on industry liability. We have never been close to requiring the federal bailout. So why keep it? The industry sure would like to keep it. Whether it's right or not, they are still benefitting from it. They don't have to pay as much for their insurance. But really, Price-Anderson, as well as other international agreements along similar lines, should be scrapped. No accident in the West has ever come close to needing it. The industry should have full liability for any damage it causes. This is because nuclear power is safe and so won't need to worry much as long as they do their jobs properly. If potential investors don't realise this, then we in the pro-nuclear blogosphere need to work harder. Flamanville-3 has been approved by the EU (how nice of them). And where there's one, there'll be others, especially in a place like France. It looks like nuclear power is here to stay in Europe. That's fortunate because the UK will be needed ever more of French electricity as it continues to allow excessive Greeniness to undermine its efforts to look after its economic needs. There's a press kit available now on the EDF website. Christmas is coming: how about a trip to Iran? Iran is now going to be running tours of its nuclear sites. It's a bid to encourage the world that their nuclear ambitions are peaceful. Of course, the job would be much easier if the tours were extended to IAEA inspectors. That reactor does look good though. It's probably well worth a photo op. The most noticeable thing about it is how many colours there are. The second most noticeable thing is that is has lots of statistics in it as you would expect. 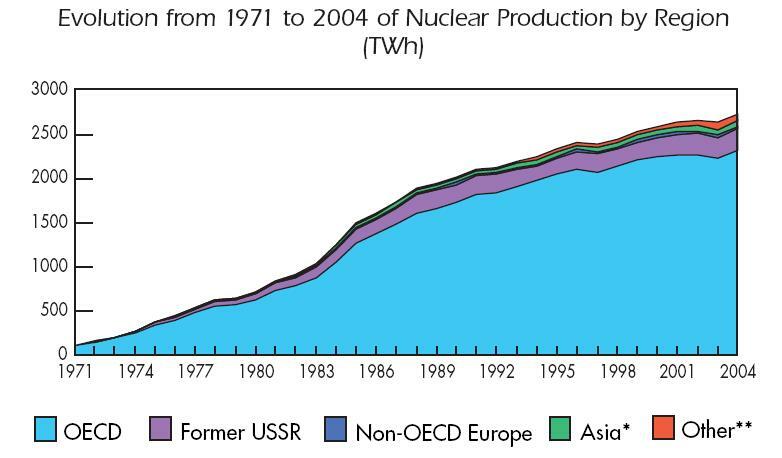 The graph comes from page 16 showing the nuclear production. 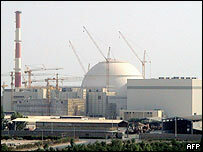 Over the period between 1994 and 2004, nuclear production worldwide grew by 20% and within the OECD by 15%. You may be wondering where all this OECD capacity came from if nuclear power has been "dead" all these years. First, the OECD includes Japan, which is committing to expanding its nuclear sector as part of a strategy of energy security. Second, just because new reactors are not being built, it doesn't mean that capacity is not being expanded. In the US, efficiency improvements and capacity uprates totalling near 5GW, has achieved the effect of adding capacity, without actually building new units. So to the question of why there has been no new build recently, why build a new unit when there is so much potential to squeeze more capacity out of the ones you've already got?